The Inner Niger Delta for which OPIDIN provides an annual flood forecast is flooded by the Niger and Bani rivers. 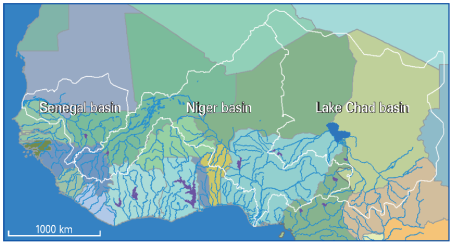 The headwaters are situated in the Upper Niger Basin. The Niger river is a typical Sahelian river with a distinct wet and dry season. A large part of rain in the northern tropics is drained off by rivers running through the Sahel (Fig. 1). These rivers feed the large floodplains and other wetlands in the semi-arid Sahel. The annual discharge of the rivers varies considerably. This is not caused by variations in rainfall in the Sahel proper (being too low to have an impact on the river flow), but is closely correlated with the rainfall further south in the catchment area of the rivers. The Senegal, Niger, Chari, Logone and Nile lose a lot of water during their passage across the Sahel, due to evaporation and infiltration. Especially in dry Sahel years, the rivers lose a large part of their flow. After a series of dry years the ground water table recedes and the rivers consequently lose even more water. River flows in the Sahel therefore not only depend on rainfall in the preceding months, but, to a large extent, also to rainfall in earlier years. Most Sahel rivers had a natural flow until about 1980, but this state has changed considerably since then. Due to the construction of the Manantali dam in the Upper Senegal River, a huge reservoir of 11 km3 came into being. During the rainy period a large part of the river flow is stored in the lake to be gradually released in the dry months. In this way electricity can be produced and irrigation of farmland is possible during the dry period. The Selingue dam has a similar impact on the Upper Niger River as the Manantali in Senegal and Mauritania, although less drastic due to its smaller size. In North Nigeria and Cameroon dams have also affected the river flow, with significant consequences downstream for the seasonal floodplains and marshes. Fig. 1. The three major drainage basins in West Africa: Senegal, Niger and Lake Chad, and (shown in purple) the 12 largest water reservoirs. Manantali and Selingue are the only two big reservoirs in the Upper Senegal and Upper Niger, respectively. From: Zwarts et al. 2009. Living on the edge. The Niger River is 4184 km long and its drainage basin covers an estimated 2.2 million km2. Like other rivers in West Africa, the Niger demonstrates huge between-season variations in discharge. For instance, the average discharge of the Niger at Koulikoro (SW Mali) in September is thirty times larger than in April. This is caused by the short but intense rainy season, reaching a peak in August. It takes some time before all this surface water finds its way via shallow gradients into the Upper Niger, which normally reaches its maximum height in September or October before it reaches the Inner Niger Delta. Sahel rivers, draining lowland catchments, have a characteristically low flow rate. The length of the Niger means that it takes 6 months before the rainfall in Guinea reaches the ocean. 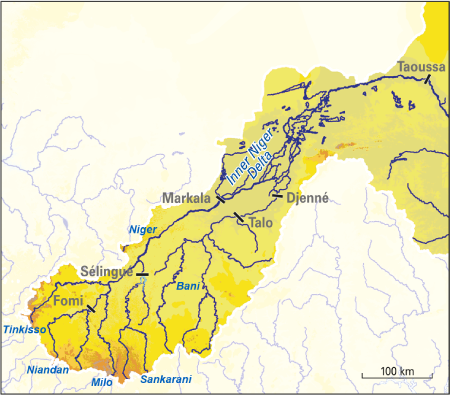 The Niger and its Niandan, Milo and Sankarani tributaries rise in the Guinean Highlands (Fig. 2). The most northerly branch, the Tinkisso, originates in the Fouta-Djalon. The main tributary to the Niger is the Bani, which drains southernmost Mali and the northeastern corner of Ivory Coast. After the Bani flows into the Niger near Mopti, at the southern edge of the Inner Niger Delta, there is no further run-offf from eastern Mali and Niger. Consequently, evaporation gradually diminishes the river flow. The total catchment area of the Bani (129 000 km2) is nearly as large as the rest of the Upper Niger Basin (147 000 km2). Yet the discharge of the Bani is less than half of the Niger, because the Bani sub-basin receives less rainfall than the other sub-basins of the Upper Niger. Fig 2. Location of existing (Selingue, Markala and Talo) and planned (Fomi, Djenne and Taoussa) dams in the Upper Niger Basin. From: Zwarts et al. 2009. Living on the edge. The Inner Niger Delta in Mali is huge. 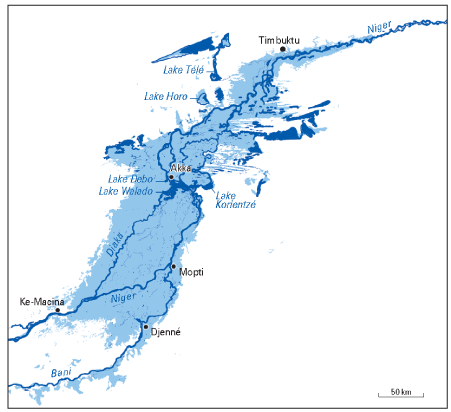 On topographical maps from the 1960s, a total surface of 36,000 km2 is designated as floodplain (Fig.3). When the water level starts to rise in July in the southwestern part of the Delta, the plains in the northeast are still dry. By the time that the northern plains become flooded two months later, the water level is already declining in the south. The area covered by water at any one time amounts to 25,000 km2. Such a large flood extent is only possible when the combined inflow of Niger and Bani, the major tributary, exceeds 55 km3 in the rainy season. In most years, the inflow is smaller. During the disastrous drought in 1984, the inflow was only 15 km3, and the flood extent did not exceed 7800 km2. The Inner Niger Delta not only stands out because of its size, but also due to its hydrological dynamics. Between July and December the water rises by more than 6 m in wet years, to decline by the same amount in the following months. In extremely dry years, however, the flood level rises only by 3 m.
Fig. 3. The floodplains (light blue) and permanent water bodies (dark blue) of the Inner Niger Delta, as indicated on the topographical maps of the Institut Géographique National. The maps are from 1956, and based on aerial photographs and field work in the early 1950s, a period with very high floods. From: Zwarts et al. 2009. Living on the edge.